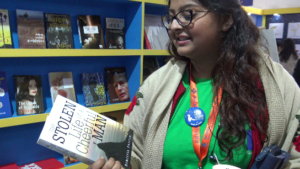 Gurshaan Kaur comments on the one remaining copy that wasn’t stolen of The Stolen Life of a Cheerful Man by Dimitris Politis at the New Delhi World Book fair. The contentious yet universal issues of intolerance and understanding, discrimination and acceptance, violence, terrorism and forgiveness come to life. Dimitris Politis plunges boldly into the Irish reality but always in equilibrium with his Greek consciousness. 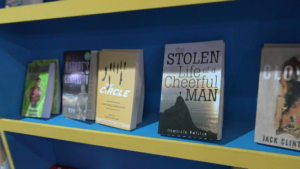 The Stolen Life of a Cheerful Man explores the area between Greece and Ireland, where the glittering Aegean waves are crowned by the rainbows of the Atlantic and the west coast of Ireland. The reader is drawn to the story through its exciting twists and turns, interlinked through a fast cinematographic pace: the book is an excellent contemorary example of “black” fiction with a subtle and delicate deepening of sentiments, feelings and beliefs linked to the human nature. It voices a loud protest against social and historical stereotypes and is a stern warning of how intolerance and ignorance can lead to disaster. In today’s world where many countries are mired in a financial crisis, where make people tend to forget the importance of tolerance and acceptance of their fellow human begins, the author cleverly reminds us that difference and diversity are universally present: they indeed shape our world, they are the rule rather than the exception. He prompts us to remember that we are all born different and grow up differently, making each of us very special in our own unique way whatever the circumstances. Dimitris Politis was born in Athens, Greece on 16 March 1960. He studied Economics in Greece and Classics and Literature in Ireland. He has lived in Greece, Ireland, UK, Luxembourg and Belgium. He has published articles and reviews on Working Conditions and Occupational Health and Safety and short stories in literary magazines and websites. His first novel “The stolen life of a cheerful man” was published in Greek in 2012. His second novel in Greek “The next stop” is nearing completion. He currently lives in Brussels. He works as a Webmaster and Editor for the EUROPA site of the European Union.